Today we have a new study where researchers have created immune cells that ignore the way cancer tries to hide from detection. Macrophages are one of the types of immune cell and are responsible for dealing with dangerous cells, such as those which have become cancerous. The problem is, most cancer cells bypass the immune system by fooling the immune cells into leaving them alone. Cancer cells present certain molecules on their surface that act like a “do not eat me” signal to macrophages which would otherwise engulf and digest them. This ability to evade detection by the immune system is one of the reasons cancer is hard to treat effectively. Immune cells are patrolling the body constantly and looking at the surfaces of cells for the telltale signs that something is wrong, so when cancer cells hide those signs and pretend to be healthy cells the immune system cannot deal with them. Without the immune system taking action, there is nothing to stop cancer spreading beyond control and killing the patient. 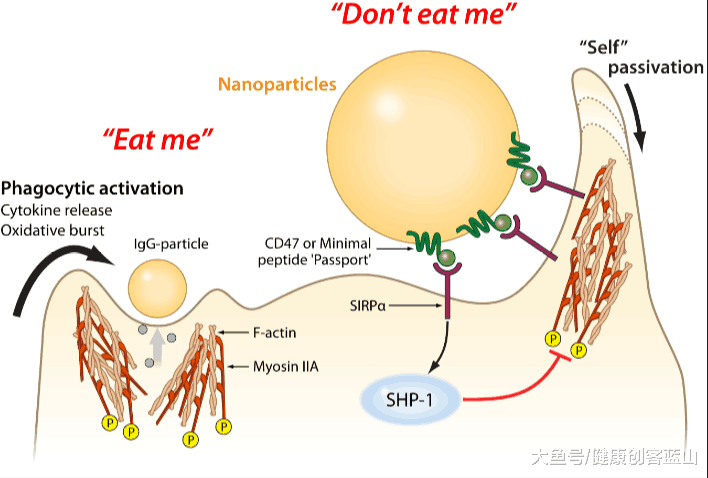 The researchers in this new study have demonstrated that they can produce re-engineered macrophages that are able to ignore this “do not eat me” signal that cancer uses to hide. In the past there have been attempts at doing this, though they proved to be harmful to healthy cells and did not make it to the clinic. This new approach avoids damage to healthy cells and is a step in the right direction for cancer immunotherapy. 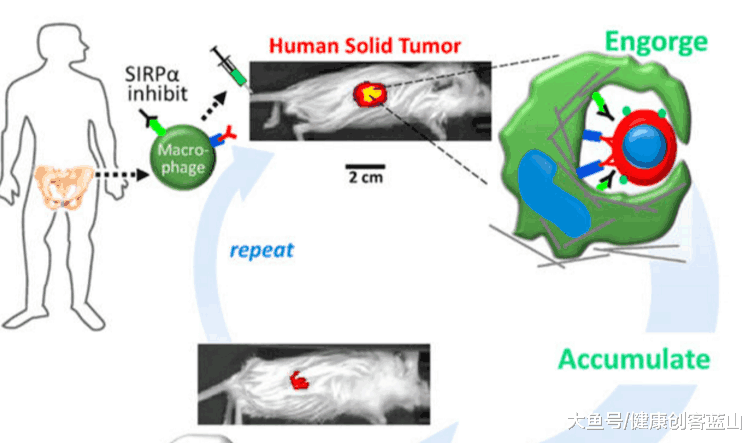 The research team were able to re-engineer macrophages that had the ability to travel through the body of a mouse, penetrate solid tumors and engulf the human cancer cells inside. Other therapies using modified T-Cells have also recently enjoyed success on the cancer immunotherapy front, in particular for blood cancers, referred to as liquid tumors. However, tumors in other tissues can be more solid, which makes it difficult for T-cells to invade the tumor as they cannot penetrate the outside. It has been known for decades that macrophages can easily penetrate such tumors, and due to this, macrophage-based cancer therapies were tested years ago. Unfortunately they were not effective in destroying the cancerous cells. It is now apparent that this is because the cancer cells were using the “do not eat me” signals healthy cells use to avoid destruction. 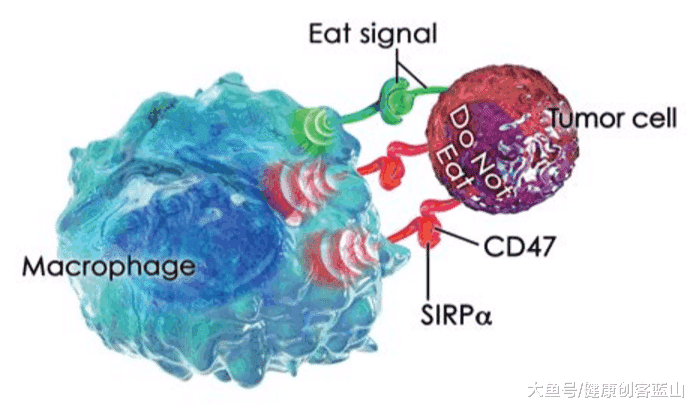 The research team has demonstrated that a protein called CD47 on human cells acts as a “marker of self” by interacting with a protein on the surface of macrophages called SIRPA. When SIRPA comes into contact with CD47 on another cell, it tells the macrophage not to engulf the other cell and marks it as friendly, even if that cell is cancerous. The researchers thought that regulating this protein may be the key to using macrophage-based therapies effectively. In the past people have attempted to use antibodies that block CD47 and stop it interacting with SIRPA on macrophages. However, such attempts in the past have caused rapid loss of circulating blood cells because the macrophages attack healthy cells too. This lead to anemia and even death from autoimmune disease in the mice tested. The researchers here have bypassed this problem by taking young macrophages and blocked their SIRPA directly. They also injected various antibodies that bind to cancer cells to help activate the macrophages and encourage them to invade the tumor. The researchers observed that the macrophages circulated in the body but accumulated at the location of tumors where they began engulfing cancer cells. After two injections the cancer cells were reduced 100-fold in size, going from the size of a dime to an eighty percent decrease in size. Also importantly, the researchers observed that blood cells were not affected by this treatment, suggesting the approach is safe. 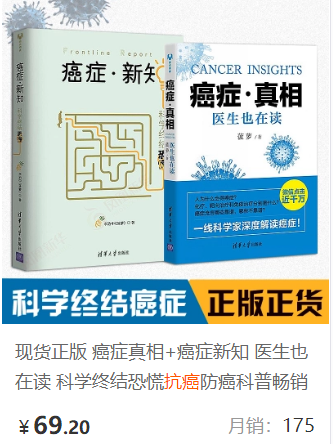 Finally, the researchers noted that the macrophages eat the cancer cells for about a week after injection but then stop. However, additional injections continue to safely induce tumor regression. The team is now working on ways make the effects longer lasting whilst minimizing side effects such as damage to healthy cells. Immunotherapy represents one of the most promising areas of cancer research and it is our hope that in the not too distant future it will become the standard of care, replacing harsh chemotherapy and radiotherapy which appear to do more harm than good. Cancer is the poster child of aging diseases, and whilst younger people do get it too, it remains predominantly an age-related disease caused by genomic instability, a primary hallmark of aging. If we are to hope for healthier and longer lives beyond the current norms that medicine allows now, then we must find robust solutions to cancer. Immunotherapy could well be that solution, and if recent news is anything to go by, we may soon win the war on cancer. Let’s hope so. Alvey, C. M., Spinler, K. R., Irianto, J., Pfeifer, C. R., Hayes, B., Xia, Y., … & Tewari, M. (2017). SIRPA-Inhibited, Marrow-Derived Macrophages Engorge, Accumulate, and Differentiate in Antibody-Targeted Regression of Solid Tumors. Current Biology.